Portadown missed a chance to go two points clear at the top of the Irish Premiership table as they were held at home to Warrenpoint Town. Warrenpoint raced into a two-goal lead through two goals in a minute scored by Stephen McCabe and Johnny Breen. 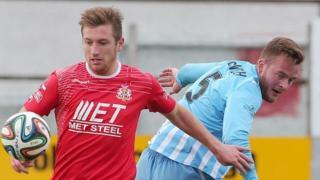 But Portadown's Mark McAllister and Gary Twigg replied to thwart Town who had Liam Bagnall sent-off.